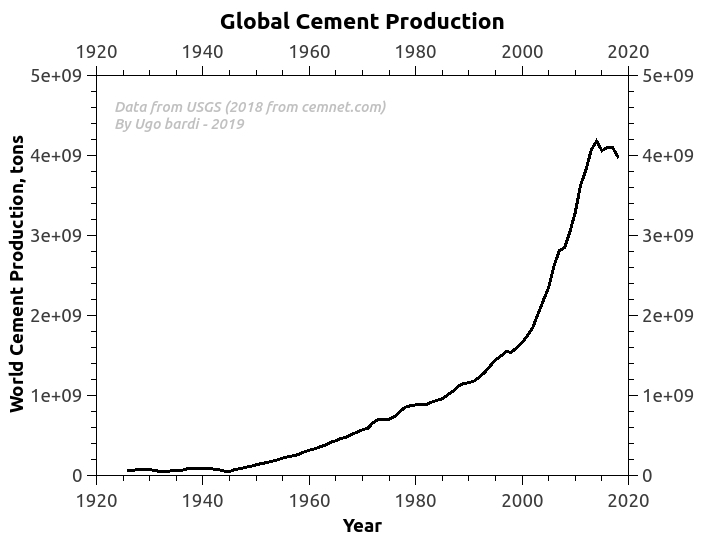 "Peak Cement" may have taken place in 2015, stopping the exponentially growing curve that would have led us to turn the Earth into a bowling ball, similar to the fictional planet Trantor, Galactic capital in Isaac Asimov's series "Foundation" (image source). 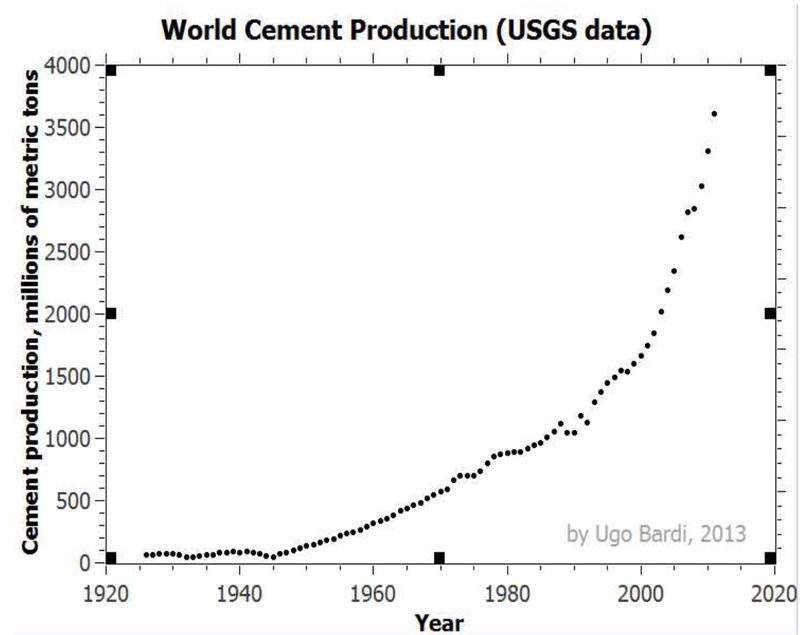 When giving an example of an exponentially growing production curve, I used to cite cement production. Look at the data up to 2013: a beautiful growing curve with a doubling time of -- very roughly -- 10 years. 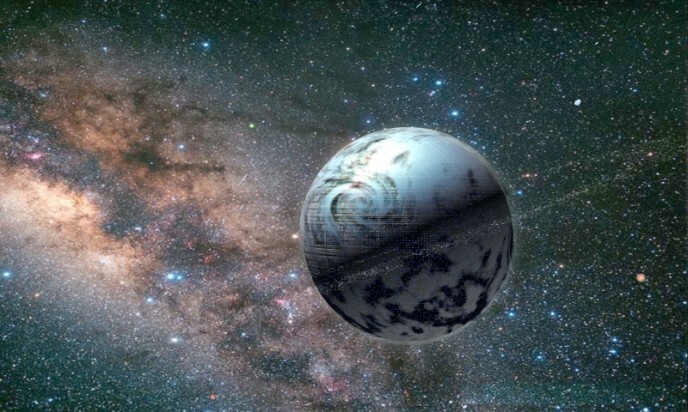 Then, if we assume that the current concrete covered area in the world is about 2% (an average of the data by Schneider et al., 2009 and the Global Rural-Urban Mapping Project, 2004) then we would get to Trantor -- bowling ball planet -- in some 50 years. Impressive, right? Steve Rocco, smart as usual, had already noticed this trend in 2017, but now it is clearer. It looks like a peak, it has the shape of a peak, it gives the impression of a peak. 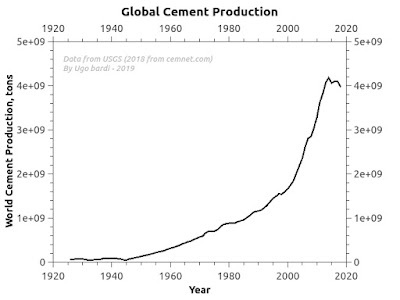 Most likely it is a peak -- actually, it could be the start of an irreversible decline in the global cement production. 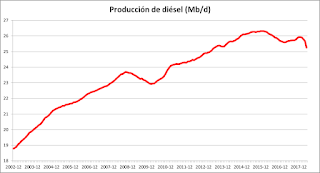 Now, what caused the decline? If you look at the disaggregated data, it is clear that the slowdown was mainly created by China, but not just by China. 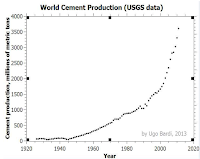 Several countries in the world are going down in terms of cement production -- in Italy, the decline started in 2010. My impression -- that I share with the one proposed by Rocco -- is that this is not a blip in the curve, nor a special case among the various mineral commodities produced nowadays. It is a symptom of a general problem: it may be the clearest manifestation of the concept of "peak civilization" that the 1972 "Limits to Growth" study had placed for some moment during the 1st or 2nd decades of the 21st century. So, are we really facing "peak civilization"? It is hard to say. On a time scale of a few years, many things could change and, in any case, you don't expect peaking to take place at the same time for all mineral commodities, everywhere. A strong indication that the whole world system is peaking would come from the behavior of the global GDP. Rocco had proposed that also the GDP had peaked in 2015, but the data available at present are insufficient to prove that. In any case, it has been said that we would see the great peak "in the rear mirror"and this may well be what we are seeing. 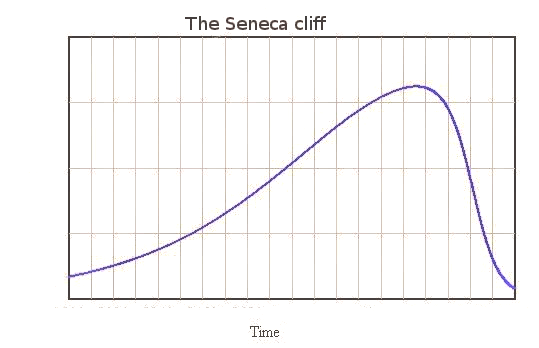 Whatever is happening it will be clearer in the future but, if it is really "the peak", expect the Seneca cliff to open up in front of us in the coming years. And maybe it won't be such a bad thing(*): did we really want to turn the Earth into a bowling ball? We will see. Anyway, to me it is not strange that many commodities are peaking in the same period: possibly there is a common cause in the seizing up of the global economy, fueled by the lowering of the EROEI, but also by the worsening of the ecosystem services and overpopulation. This is amazing information. Do you know how does this track the Limits To Growth BAU model? "Limits" are here, as expected. I=PAT. 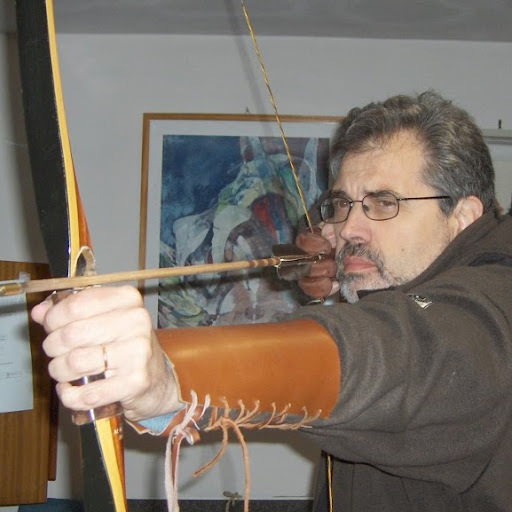 - The "one proposed by Rocco" link probably has the wrong target. - The "Rocco had proposed" link returns a 404. Thanks. Should be OK, now! I have often say to my old TOD friends who say PO is dead, that if FFs and other resources are under no threat of running out why is the world economy not using up more and more of everything and everyone getting more money, less inequality? Most don't respond, some say "thats exactly what is happening". Wrong! 1st, yes, we are living out the myth of Cassandra. 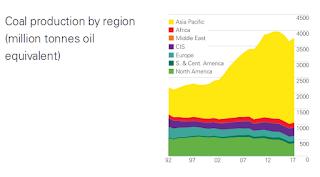 2nd, peak conventional oil is peak energy equilivent slaves, and, therefore, peak credit. CapitalismFail's responsibility-free 'free' market paradigm (of infinite growth on a finite planet) is incompatible with peak credit. QE, and it's bubble, masks the fine mess we have gotten ourselves into. Carbon offset trading and climate insurance financial mechanisms evolving out of the Paris Agreement are a desperation bet to keep a flash frozen collapse frozen. Geoengineering is standing in the wings as a QE-like rescue to be dragged on stage to shore up the offset trading and insurance mechanisms when they start to implode. Have I missed anything? And [privileged] Boomer retirement dynamics is driving some of the peek cement thing. There are already too many hotel rooms globally to house us on our 'golden years' junkets …& think fools' gold./? Greg - Good summation. I would add 6th Mass extinction well under way but not a peep out of the MSM perhaps because the peepers have gone extinct. The effects of Peak Conventional have been masked by the Shale/Fracking surge. But when we hit Peak Shale, we will also hit Peak All-Liquids. Expect a year or two of lag-time after Peak All-Liquids and then the global economy will start to seriously fall apart. So does anyone here have any opinion on when we should expect Peak Shale? The dip in cement production is the bursting of the Chinese city building bubble. Entire cities lie nearly empty and crumbling after massive speculative over building. Coal consumption is down in China as environmental concerns shut the least efficient and most polluting power stations. Coal is down in the USA because abundant natural gas has priced it out of the market. 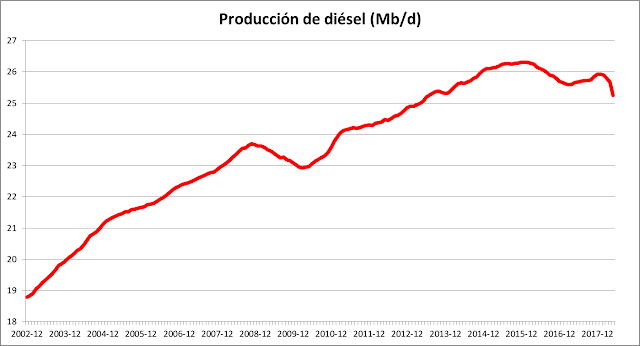 Diesel is down partly because of the emissions cheating scandal reducing demand for diesel cars in many countries, but any reduction in consumption is more than offset by increased aviation fuel use, which is an alternative product from the middle distalate fraction of crude oil. Peak will come, but I am not sure we are there yet.